I have several questions and one usb issue that I’m confused on. The main issue is I have 3 uno clone boards that won’t connect to usb. I was going thru a self learning stage and I think I messed them up. I had another working one and just put those boards aside. I recently ordered some replacement 328 ic’s with the bootloader installed and discovered the usb connect was not working. So as part of the self learning ( with help) I’m hoping to repair these 3 boards. Soldering in new smd ic’s being another lesson and if needed, I’ll deal with that. For now it’s deciding if the usb issue is a damaged ic or some flash fix option? The working uno connects to usb without the atmega328 ic plugged in so I’m focusing on the usb interface ic. My question is could it be that it needs reprogramming or is it hard coded to be the interface? If it’s posable how would I flash it? If I replace it would the new one need to be flashed. As a smd ic it would need to be done soldered onto the uno board. I will verify that the onboard regulator is working. I’ve ordered several new $6 clone uno boards but fixing these is how one learns. I did find this info that pretty much covers my questions. I’ll give it a try but would still like any tips. I found a description of how to check and how to restore the firmware of the 16U2 chip. So the code is obviously not hardcoded in this chip. And reprogramming of most of the Arduinos can be done with an USBASP programmer connected to the six solder eyes on the opposit side of the USB connector. Thanks for the fast reply. I was hoping I had trashed the code in the usb ic and even if I did or had to replace it, it seems I may have to flash it. So knowing how is part of the learning process. I may have damaged one of the boards way back when I put too much voltage (12v) on one of the i/o pins trying to use it as a volt meter type input. But I only used the regulator input to power the board. I didn’t think it would hurt the usb ic. The other 2 boards just seem to have lost the ability to connect to the usb on 2 different computers. A new unused uno works ok with the old 328’s installed except the with the blown 328. Another search seems to indicate that many have this issue and most admit doing something wrong to the atmega328 input I/o pins. I’ll check out your info and a few more from searches and probably order some replacement smd ic’s and learn to replace program them. I have the microscope and the hot air station and I’m pretty good at rework soldering but not on many ic’s this small with so many pins. 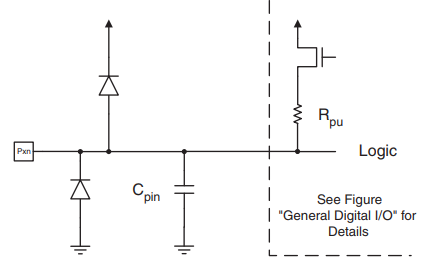 The 328 like most micros has ESD protection diodes on IO pins so that if a pin is fed with voltage outside the supply rails current will flow from/to the supply to protect the micro. This means that when you fed 12V to a pin if the source had low enough impedance you will have raised the whole 5V rail to 12V (minus a diode drop) and blown anything on the board that can't tolerate it, which very likely includes the 16U2. Only 2 ic’s on the board left. If I replace the 16u would it need programming to be a usb interface? My intention was to repair these boards but the 16u’s cost is 1/2 of what a new Chinese clone ( these were) costs. I just ordered 3 uno clones for $18 delivered so I may hold off on repairs rethinking it. I’ll keep looking for the ic’s on eBay at a good price however. I still should try and repair one board for the experience. Yes the 16u is just a blank microcontroller, will need to be programmed. Thank you, that clears up my wondering. I’ll read up on it and give it a try one one uno that shouldn’t be damaged but w7 doesn’t see it and it did last time I used it? I see I can use one of the spare uno’s arriving tomorrow as a isp programmer to see if I just messed up the other one. The links provided in the previous posts seem to cover that well.